Turns out, she didn’t have to, thanks to Linda Norwood, a graphic designer with Wells Fargo’s Wealth, Brokerage and Retirement (WBR) team, and The Puppy Rescue Mission ― a Texas-based nonprofit that works to reunite soldiers with the pets they befriend in war zones around the world. Founded in 2010 by a military wife, the organization has since rescued more than 700 animals. The only people who should have access to these bullets are law enforcement and the military. There is no conceivable reason for anybody else to need access to a handgun round that can pierce body armor. It is our responsibility to do whatever we can to keep law enforcement safe – to protect them while they protect us. And when the gun industry fights to keep ammunition like this on the street, we must stand up. Hunters and law-abiding gun owners have no need for a compact, semi-automatic firearm with ammunition that punches through body armor. Deer don’t wear Kevlar. Yet over and over again, we hear the gun industry lobby arguing to ensure that civilians have access to cop-killing bullets. Why do police need armor piercing bullets? How many crimes have been committed by people wearing body armor? Every .30 caliber rifle round can pierce soft body armor. If you are truly against “armor piercing ammo” then you should want all rifle ammunition banned. Hunting is a false argument, the second amendment never mentions hunting. At the time of the War of Independence the citizens of the colonies were just as well armed as the Redcoats. There were even towns that had their own armories stocked with cannons. In the present case, various officers of the HPD and NLVPD entered into and occupied Linda’s and Michael’s home for an unspecified amount of time (seemingly nine hours), but certainly for less than twenty-four hours. The relevant questions are thus whether municipal police should be considered soldiers, and whether the time they spent in the house could be considered quartering. To both questions, the answer must be no. I hold that a municipal police officer is not a soldier for purposes of the Third Amendment. This squares with the purpose of the Third Amendment because this was not a military intrusion into a private home, and thus the intrusion is more effectively protected by the Fourth Amendment. Because I hold that municipal officers are not soldiers for the purposes of this question, I need not reach the question of whether the occupation at issue in this case constitutes quartering, though I suspect it would not. In order to capitalize on a changing Arctic, Russia is undertaking a major military upgrade of its northern coast and outlying Arctic archipelagos. These bases — which include search-and-rescue stations, military ports and airstrips, and military headquarters — are positioning Russia to become the dominant power in the region. The Northern Fleet itself is due for a massive upgrade starting in 2015 that will last through the rest of the decade. The fleet has been upgraded to a unit called the Russian Joint Strategic Command North (JSCN), which, according to the Polish Institute of International Affairs, won’t be an ordinary naval force. The attack began around 5 p.m. when a car bomb exploded at the hotel’s entrance, according to witness Aden Hussein, who said he was meters away from the hotel when the blast happened. Gunmen then went inside the hotel, shooting people, Hussein said. A few hours after the assault began, state-run media reported that security forces stormed the building and killed the remaining assailants. Repeals the Patriot Act (which contains the provision that allows for the bulk collection of metadata from U.S. citizens). Repeals the FISA Amendments Act (which contains provisions allowing for the government to monitor emails). It would extend judges’ terms on the Foreign Intelligence Surveillance Court and technical and legal experts to advise on technical issues raised during proceedings. Mandate that the Government Accountability Office (GAO) regularly monitor such domestic surveillance programs for compliance with the law and issue an annual report. Ban the federal government from mandating that the manufacturer of an electronic device must install spy software. Gives people a proper channel to report illegal activity in their department. Says that no information related to a U.S. person may be acquired without a valid warrant based on probable cause—including under Executive Order 12333. Retains tools that are useful to law enforcement such as not requiring a new warrant if the suspect switches devices in an attempt to break surveillance. Protects intelligence collection practices involving foreign targets for the purpose of investigating weapons of mass destruction. Kinetic Development Group is proud to announce the debut of their SAS – Scar Adaptable Stock System. Just a few months ago, Kinetic Development Group launched its company with the promise to bring solutions to the small arms market for high quality firearms. They started with the FN SCAR as many SCARs are deployed with our Special Operations Forces. 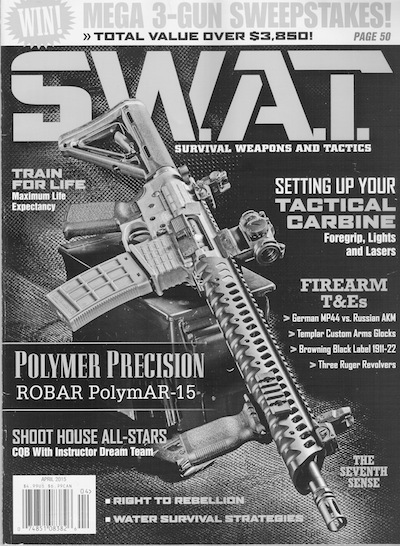 They also recognize the 16S and 17S are increasingly popular with American shooters and law enforcement. Their first products, the MREX (modular rail extensions) for the front end of the SCAR has been very popular. 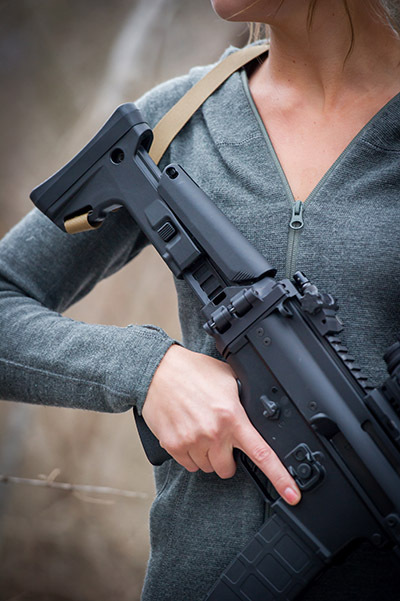 The KDG front and rear sling points have also brought the SCAR into the year 2015 as far as QD sling solutions go. Well, they have just addressed another common complaint about SCAR. Some refer to it as the SCAR’s “UGG Boot” like stock system. The KDG S.A.S (SCAR Adaptable Stock) is a serious improvement on the SCAR OEM stock system. Form…. Why is this solution a near perfect marriage of a very well designed and reliable rifle and the excellent ergonomics of the Magpul ACR stock? It doesn’t take a rocket scientist to compare the two stocks and decided which is more robust. MagPul is famous for their reinforced polymers and most would argue nobody can beat them at their game. There are many empirical reports from the field complaining about broken SCAR stocks. To add to that strength is the KDG SAS coupling that is made of 6061 T6 aluminum billet that is black hard coat anodized. That not only reinforces the stock, but also the open rear end of the SCAR’s thin extruded U-shaped receiver. And to top it off, the KDG SAS assembled stock system weighs approx. ¼ pound less than the all polymer factory SCAR stock assembly! Fit & Function… All SAS kits come standard with 7 positions of length adjustment, cheek weld height adjustment, an AMBI QD sling attachment point, a weatherproof battery compartment, and a side-folding feature. Like the factory stock, the weapon can be fired with the stock folded. KDG also added an optional set-screw to allow users the option to eliminate any play between the stock and receiver. Aesthetics – There are many SCAR owners that are simply not fans of the factory SCAR stock. Its clunky feel and look take away from the amazing rifle they just purchased. The new SAS not only improves the function of the SCAR rifle, it looks a hell of a lot better as well. Computer scientists at Carnegie Mellon University concluded that a dozen or so popular Android apps collected device location – GPS coordinates accurate to within 50 meters – an average 6,200 times, or roughly every three minutes, per participant over a two-week study period. The researchers recruited 23 users of Android version 4.3 from Craigslist and the Carnegie Mellon student body. Participants were allowed to use their own choice of apps after installing software that noted app requests for a variety of personal information; not only location but also contacts, call logs, calendar entries, and camera output. They weren’t told the purpose of the study and were screened to weed out people who had a technical background or strong views about privacy.